Every year, there has been many expert printers at the summer camp. This year, we ask you to go wild and push the boundaries of what you can do with printing and eTextiles. From printing thermochromic ink to conductive paint, the possibilities are endless. But what can you do when you go beyond the “usuals” and put all the expertise together? Of course i want to be in! OK, being a printer for a long time now and choosing this topic is not a form of bravery but I love to push the boundaries of a technique and I’d love to compare my practice with others expert in the field. I don’t always have time to *geek out* so summercamp will be the place to do so! Last year I enjoyed the workshop we held with Sara Roberson so much, now I would like to go further, to find new solutions for special inks, using the power of love for chemicals. 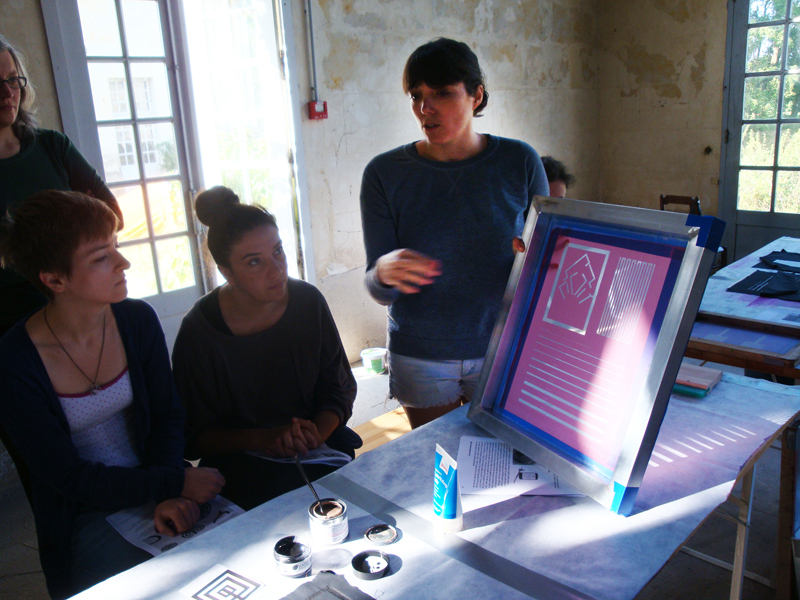 Printing with minerals, concrete, plants, herbs, or even food surrounding us in Paillard would be nice to try them out. Lately we have been experimenting with the suminagashi technique, that would be interesting for the special printing techniques too. I subscribe and would love to Geek Out with all you other print geek peoples. I too am interested in what Judit and Celine have already mentioned above. I like the idea of creating a printing set up from start to finish from materials that are readily available and can be sourced from our surroundings. This could involve anything from making screens from knitting/weaving or any available materials, frames from salvaged wood or other available materials. Also other printing techniques like relief, block and Lino to name but a few. The idea of creating our own responsive inks even if they are time based only and must be recorded in some performative way to capture their lifetime is of interest to me. Irreversible effects and one time happenings created by the changeability of time based dyes that we can potentially create would be great to explore. Sent from the Sarah (who’s not still not sure what to sign up to)…all sounds good. I am interested in this focus group. There are several reasons for that, one being that I skipped the printing workshops the last two years :). But I am also tempted to combine it with the sustainable focus group. So I think that I am in line with Celine , Judith and Lindsay on this. Some years ago, I did a lot of explorations on natural dying (sorry no photos) and it will be interesting to combine these two explorations. Bring all your fibre optics Sarah! I’d like to weave and see if we can print through our weave… Little looms?? ?